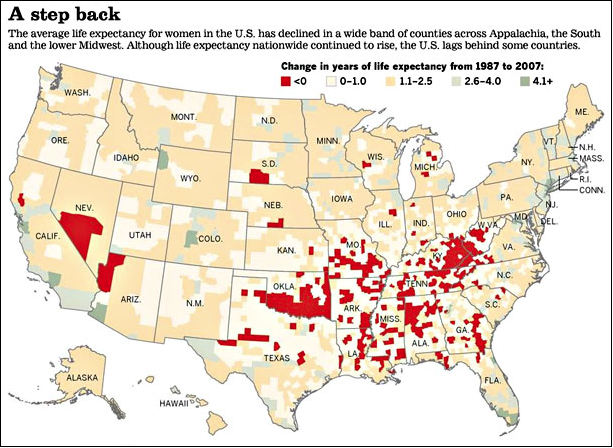 The map below shows areas of the US where life expectancy fell between 1987 and 2007 (in red). At first glance it seems that rural areas are overrepresented in falling life expectancy. There is usually is typically a strong inverse correlation between obesity and income, which would appear consistent, but also one could guess that more automation of rural jobs, and greater propensity of sedentary recreation activities (the internet etc), may be a contributing factor. Since then more evidence of decreasing life expectancy is dripping into the debate, especially in the US. 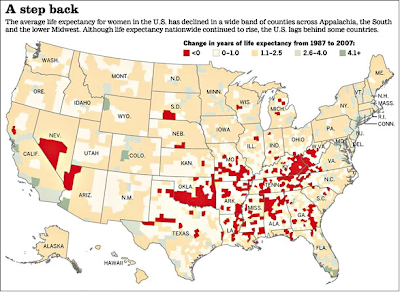 One recent study suggests that based on data from 2008, the latest available, life expectancy in the U.S. fell 36.5 days from 2007 to 77.8 years. But the overall picture still looks very good. 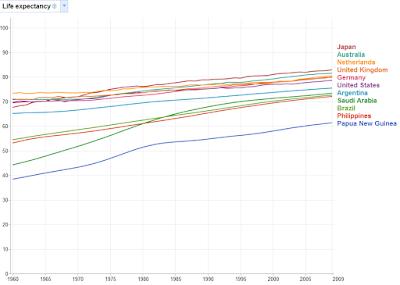 The below graph compares the growth in life expectancy in a selection of countries. For me, the surprising thing in these data tables is that our life expectancy at birth is rising mostly due to the prevention death earlier in life, not the extension of life after 85. If you make it that far, you have only gained six months of extra life expectancy over the decade – around a quarter of what you gained at birth (one fifth for men). The other trend of note is that men are catching up to women in the life expectancy at birth. Again, this concurs with the observation that early preventable deaths are being reduced, as risk taking behaviour is disproportionally male. A couple of questions spring to mind. First, will the rising trend in life expectance continue in the rest of the world? And second, the big question is whether there is a biological limit to life expectancy that developed countries are trending towards, to whether peoples lifestyles are compensating for improved medical care by being less vigilant about their health or taking more health risks? When I watch extreme sports I often think that it could be a sign that we as a society have made life so risk free that people need to compensate by taking on risky activities. I would classify this type of risk as low probability but high impact, and it is the type of risk we seem to regulate tightly, with seatbelts, helmets, fire alarms and other safety precautions. My interpretation is that as a society we have removed many high impact low probability risks, but compensated them to a small degree. This compensation must be small, as the data show that the prevention of death early in life the key reason for increased life expectancy at birth. The other type of risk, high probability but low, or distant, impact is what we usually don’t address well. 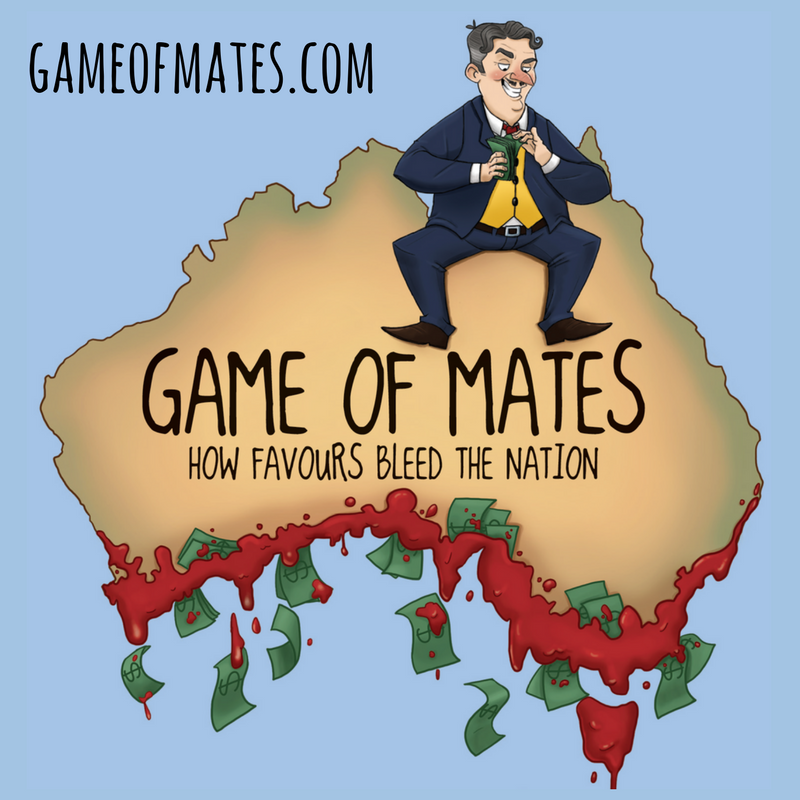 Smoking laws in Australia are probably the stand out success in this area. But when we do address them, they are the easiest risks to substitute for others. For example, a former smoker might find that chomping down a bit of chocolate is a good substitute for their addictive habit. Further, we might be avoiding high impact risks by substituting for low impact risks. Parents need to be especially aware of this. For example, cycling appears to be dangerous because of the need to wear helmets, so parent might be less inclined to encourage cycling. The same goes with sports where there is a perception of high risk, such as rugby or Aussie rules football. Even the most basic of actions such as walking to school is often seen through the high risk lens (due to the low probability of abduction) and a generation used to being dropped at the gate may be less likely to walk later in life. I have no definitive answer to either question. My gut feeling is that medical breakthroughs will stay one step ahead of any compensatory behaviour, and that life expectancy will creep up ever so slowly. 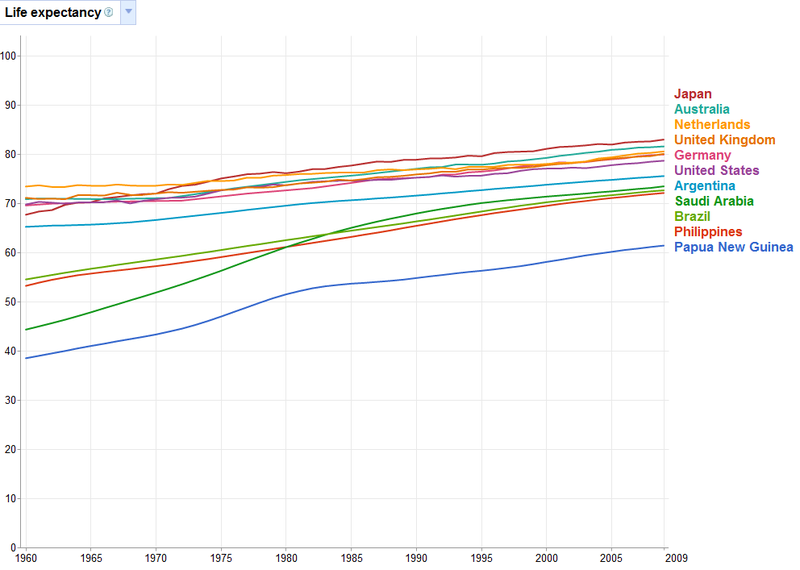 I also feel that life expectancies between countries will continue to converge. But I will be on the lookout for more evidence of a peak in life expectancy elsewhere, and should we see this case arising more frequently, I believe that the theory of compensatory behaviour will need serious investigation. Regarding Australia’s average age. It may be that preventative care is leading to an increase in the average age of males and females. It may also be that people are living longer as they are being more risk averse in the way they live their lives. But I believe that the average age in increasing also because some people have become more health conscious and are living more healthily. I’m not sure of the proportions, but there appears to be a trend where those that are less health conscious remain that way (but I feel that this is probably improving) and those that are more health conscious continue in this vein. However, as people become more educated, they (in general) adjust their eating and exercise habits/routines and this may be impacting the growth in Australia’s average age. 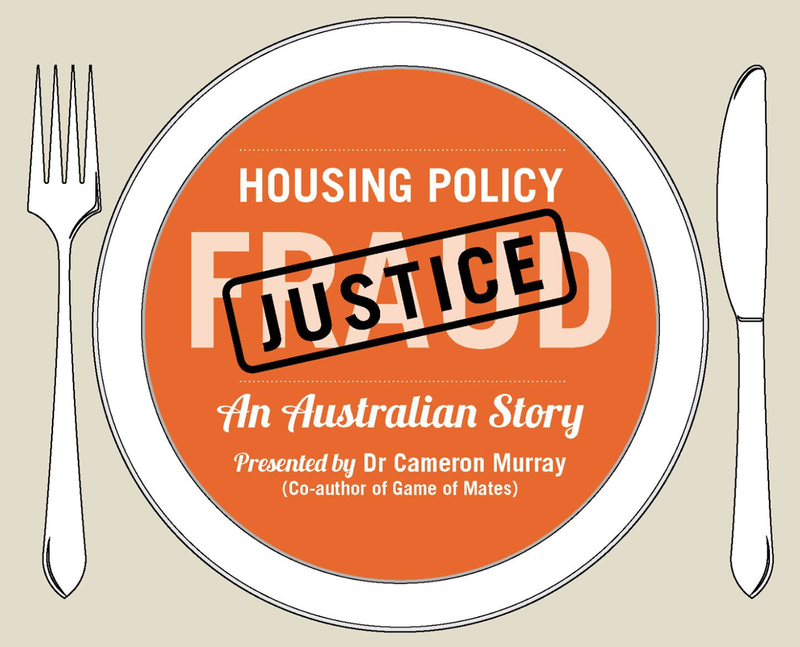 We may say that people these days are more time poor and as such may tend to eat more take away foods than may have been the case in the days when it was more common for mums to stay at home. However, the proliferation of gyms in the past two or so decades would surely have to reflect that some people are becoming more health conscious and that this is contributing to longer lives. >When I watch extreme sports I often think that it could be a sign that we as a society have made life so risk free that people need to compensate by taking on risky activities. my view on this is that people also take on risks because there is nothing to let them know that injury will be permanent or any concept of responsibility for actions ... sure I'll get hurt, but the hospital will fix it. I feel that 90% of the health benefits to society were obtained by simple things like washing your hands, cooking food. Basic hygene and nutrition.